November 14, 2018 by Ecommerce News. About Marketplaces with tags The Netherlands. 3358 views. Bol.com, the major Dutch online retailer, is transforming into a marketplace for third party sellers. Nowadays, there are over 20,000 sellers active on the Bol.com platform and they account for about 40 percent of the company’s sales. Similar to Amazon, Bol.com started as an online book store, it soon expanded its offering with other media and product categories, to eventually turn into a major online marketplace which offers a platform for other retailers, who want to gain a bigger audience. And now it’s relying a big share of its sales on those third party sellers. Ahold Delhaize, which acquired Bol.com in 2012, presented its Leading Together growth strategy at Capital Markets Day in New York and in a PDF file called “Europe Ecommerce & Digital“, the retail company shared some interesting numbers on Bol.com. The online store currently offers 16 million products, while it attracts 700 million website visits. The company’s net consumer sales grew from 0.4 billion euros in 2012 to approximately 2 billion euros at the end of 2018. This year, Bol.com has achieved a year-on-year growth of 30 percent, thereby outperforming the market (which grows by 14 percent year-on-year). Bol.com, which also has a dedicated ecommerce website in Belgium, now has 9 million unique customers, which is two million more than in 2016. Ahold Delhaize says Bol.com is a major growth driver for the Benelux region with improving profitability. When the third quarter of this year gets compared to the same quarter last year, the frequency per customer has increased by 16 percent, the number of active customers grew 14 percent, while the order growth is now 33 percent bigger. Also, the fulfillment costs per order decreased by 3 percent, while the average order value increased by 2 percent during the same period. And to top it all off, the customer satisfaction saw an increase of 2 percent. 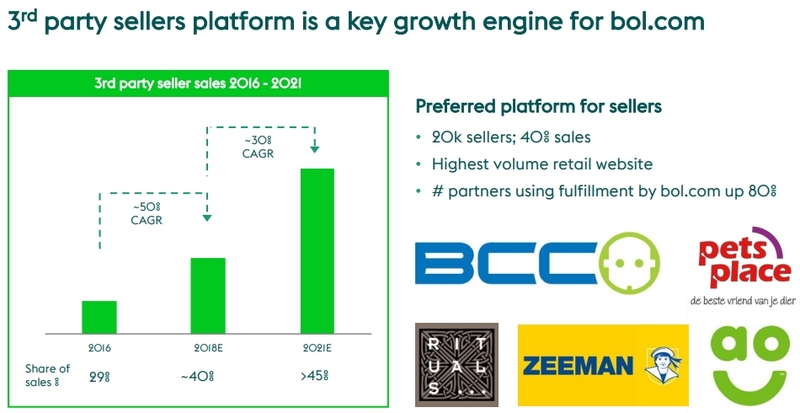 Ahold Delhaize also acknowledges the fact that Bol.com’s third party sellers platform is a key growth engine for the ecommerce player. Two years ago, the external vendors made up 29 percent of Bol.com’s sales, while they currently account for 40 percent. And at the end of 2021, a share of over 45 percent is even predicted. Ahold Delhaize say it will invest to drive continued growth at Bol.com. The company wants to create the best network for their third party partners. Among the investment priorities are Bol.com Fulfillment Center II with state-of-the-art mechanization, the expansion of fulfillment and service solutions for the Bol.com partners and the expansion of benefits at Bol.com Select, the company’s subscription membership.